I’ve been side-tracked from my Spain trip travel log by blatant consumerism. Late last week I was sitting in front of the TV one night finishing up some work between watching my favorite shows. (I love 30 Rock! I’m also fond of Parks and Recreation and glad it’s back on the air.) A commercial came on for a national Toyota sales event — 0% financing on the 2010 Prius — and my interest perked up. With a laptop so close at hand (when isn’t one pretty much attached to me these days?) I could investigate this a bit more online, and I did. I started looking up the specs, which meant visiting car sites like edmunds.com since the Toyota site was featuring the 2011 Prius information by now. As I investigated more that evening and at odd times the next day I was getting a bit excited. A new car! A hybrid that would make visits to the gas pump a rare event! Fun features like Bluetooth for my phone! And that 0% financing…well, that was sweet! My current car (a 2002 Saturn wagon) was purchased during a 0% financing event. Back then I was driving a Saturn S sedan that I had purchased new with financing somewhere around 8%. I had one year left on the loan and was glad to trade up to a more luxurious car and not pay any interest at all. I was in the dealership getting standard maintenance when I saw the 0% event and it didn’t take long for me to get very interested in one of the two remaining wagons they had on the lot. I ended up coming back the next day to buy the car. My credit was so good that I had no problem qualifying for the financing (over a 60-month period) and I declined to put any additional money down other than my trade-in. I’ve been quite happy with the car and made my last payment a few years ago. It’s nice being free of a car payment. Over the past two years I’ve had to pay out a bit more for maintenance than the standard oil changes, tire rotations, and filter replacements. The battery died and the car had to be towed out of my garage to a mechanic so it could be replaced. The brakes were replaced. An oxygen sensor was replaced. The airbag light came on and some other sensor had to be replaced. I bought new tires last fall, and I’m now potentially looking at some power steering repairs that will be in the triple digits. For a nine-year old car, none of this is completely out of line, though. And let’s say it again: it’s nice being free of a car payment. I was with some friends on Friday night and I floated the idea of me buying a new car to them. One of these friends purchased a new car just a few months ago. In her situation, it was a necessity: she has a reverse commute (from city to suburb) and her previous car was 12 years old with high mileage and getting more and more unreliable. She had done lots of research on cars and found that it was a pretty good value for her to buy new, so she’d taken the plunge. The other friend is driving an older car that is also starting to have lots of critical and pricey mechanical issues that are unaffordable for her to fix. Both of them had the same response to my idea: don’t do it. But I kept digging and researching and learning what I could about the car over the weekend. Because I regularly read personal finance blogs I’m fairly well-informed about other people’s car buying experiences and what I can learn from them. While I understand that buying a new car is never considered an investment, my thoughts were turned to considering a new car mainly because of the unknown maintenance costs looming in my future. What if the timing belt needs replacing? What if the alternator goes out? What if the A/C stops working this summer? Buying a new car moves you away from concerns like this. (Yes, there are new cars that are lemons, but there are also warranties and laws to give you some protection.) The interest-free financing made the fact that I don’t have enough saved to pay for the car in full with cash a bit more palatable. I could pay some of the purchase price from a targeted savings account where I’ve been putting aside funds for car replacement and finance the rest without feeling ripped off. So after thinking about it some more and talking about it some more, I decided to visit a dealer and go for a test drive last night. (Toyota’s free standard maintenance for two years or 25,000 miles was the final nudge, I think.) B came along for the fun, and also because it’s usually a good idea to have a guy with you when you’re a woman buying a car. (Sure enough, the salesmen went first to B, who graciously said “Talk to her.”) Yes, the technology on these cars is fun. B is one of those folks who really loves electronics and gadgets and he was into all the whiz-bang stuff like the navigation system and the back-up camera on the test drive model. In my research I knew that this level of gear blew the car completely out of my pricing comfort range, though, so I tried to concentrate on the driving and riding experience. Then it was time to sit down and start the dance around pricing. I had sent out some emails to a couple of dealers — including this one — so I knew that it may be a little more difficult than I thought to nail down the trim level I wanted. The 2010 Prius came in several trim models, and I was interested in a mid-range one (referred to as a III) without the fancy navigation system and sunroof. While I was driving to the closest dealer for a test drive last night another one phoned me to tell me he had no 2010 Prii left at all, in fact. After a bit more back and forth where I basically said I just could not pay that much for a car and would check around with other dealers the sales manager came over and tried to fear sell me. Hadn’t I heard about the terrible tragedy in Japan? Didn’t I realize that this meant scarcity of these vehicles? I pointed out that I was looking at a 2010 model and that those were no longer being built. He countered with the increase in gas prices and how much more kind I’d be to the environment. I came back with how I drove so little that gas prices didn’t really affect me and that the environment was better off by me taking public transit every day and riding my bike. I stood up and closed up my coat. They threw out a bone: they’d knock $500 off the price. No thanks. Maybe they will sell all of the remaining 2010 Prii (isn’t the plural of Prius sort of goofy?) now that gas prices are increasing and the auto manufacturing disruption of the earthquake and tsunami ripple through to affect the 2011 Prius production line. Maybe others will be willing to pay the suggested price plus the extra padding of “documentation fees” to this dealer. When it came down to it, I just couldn’t stomach paying so much for a car and again taking on a monthly car payment. Even if I don’t have any financing costs. I slept poorly, most likely due to jet lag. Even though I went to sleep at midnight, I woke up just over two hours later and couldn’t get back to sleep until 5:30. But I wanted to go to Toledo on this day, so I was out of bed at 7:30 AM. I walked the several blocks to Atocha station and despite desperately wanting coffee, I made it my first order of business to buy my train ticket. High speed trains run between several key cities in Spain, and I would be taking my very first high speed trip this day. For the longer high speed train journeys the best prices are secured when buying tickets in advance online, but for the shorter trips such as the one between Madrid and Toledo the cost is the same online as it is in person. Atocha station was confusing to me. 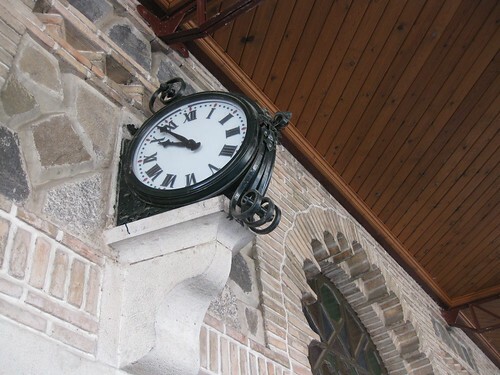 It’s a big station that not only serves as a terminal for cross country train travel, it also serves as a local commuter rail (Cercanías) station. I didn’t find the signage very helpful and had to ask where to buy my ticket. Once I secured my one-way ticket, I scoped out where to board the train. This also took me quite a while to figure out, and I was desperately wanting coffee and breakfast the whole time. Finally, I felt that I had the layout down and was able to get a café cortado and a croissant. I had 15 minutes to enjoy my breakfast, then boarded the train. In 2004 there were terrorist bombings of several Cercanías trains at Atocha station. I’m not sure if security has been beefed up since then or if there was security screening in place before the bombings, but before boarding the train we were required to put our bags through the same sort of screening machines used at the airports. This wasn’t just a Madrid station requirement, though. I took two more train trips while in Spain and for each one passenger baggage was screened. The train left at 9:20 AM and a short time later we were arriving in Toledo, approximately 72 km (45 miles) away. Arrival in Toledo. Literally a mile a minute on the high speed train! The train station was beautiful, but I didn’t have time to linger. I went all touristy when I arrived and headed for a bus that promised to drive us to the scenic overlook of the city made famous by El Greco, and then drop us in town. As I headed to the bus stand, I bought a map for 2€. I barely used this map so it was a complete waste, unfortunately. The tour bus company gave us all maps that proved to be pretty decent, so I used that one instead. The topography of Toledo and its surrounds is very hilly and I was also glad to not have to walk uphill into town; this alone made the 6€ bus trip worthwhile since a cab would have been similar in price. The overlook was beautiful and while it was a clear day it was also a cold one. I’m sure the open upper deck of the bus must have had the best view, but I decided to ride inside and stay a bit warmer. After we arrived at Plaza Zocodover, the main square in town, we were given some suggestions on what landmarks to visit and suggestions on how to return to the train station. And then I was off! 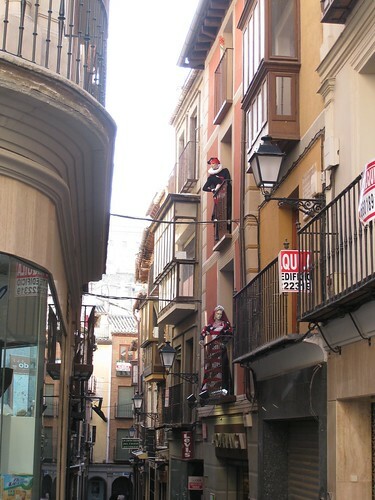 Toledo is a charming city that retains it’s medieval character. It’s well known as being the home of the painter El Greco and for its grand cathedral (visible in the photo just left of center). I visited houses of worship for all three big “religions of the book” in this small town where Christians, Jews and Muslims once lived peacefully together. It was also the first UNESCO World Heritage site I visited on this trip, but certainly not the last. I loved Toledo. Walking the hills wasn’t so bad when one can do so at a leisurely pace, and the narrow streets were very different than the wide boulevards of Madrid or Chicago. Despite snacking on a granola bar brought from Chicago and a piece of fruit purchased the day before, I was famished by 13:00 and had to eat lunch. This was early by Spanish standards, but I just couldn’t hold out any longer. I stopped at a small cafetería that looked well-populated by locals having a snack (croquettas with wine or beer seemed to be the preferred thing to nosh), took a seat at the counter, and ordered the menu del dia. This time I had a bowl of sopa del dia (a chicken broth with fine egg noodles), lomo with patatas fritas (grilled pork tenderloin with fries) and a cerveza for 10€. I wandered around Toledo a bit more after lunch. I had made it to the Sephardic Museum (housed in an old synagogue), the grand cathedral, the Santo Tomé church (where I ogled El Greco’s famous painting The Burial of the Count of Orgaz after paying 2,30€ and caught the end of a mass in the main chapel for free), and the old mezquita or mosque (I didn’t pay to go inside the mezquita here). By now it was late afternoon and I had returned to the Plaza Zocodover to decide what to do next. At 10:30 in the morning this plaza was pretty dead, but by mid-afternoon it was full of people strolling, talking, eating, and just socializing in general. I bought a few dulces (sweets) at the Mazapán San Tomé shop on Plaza Zocodover. Marzapan (as we call it in English) is a sweet paste made of almonds. Toledo is apparently well-known for mazapán and I have to say these sweets were the best marzapan confections I’ve ever had. The marzapan I’ve had in the past came from Germany and I thought it much too sweet. The Toledo mazapán was just sweet enough and had a nice fruity flavor to it. I bought about four pieces and made myself save two for later. To accompany my sweets I wanted coffee, but I also wanted to sit out on the square in the sun and not at a café table. How to get a coffee to go? I didn’t know how to ask for something “to go” and my phrasebooks (a print on and two different electronic ones on my iPhone) just weren’t agreeing on how to say this. So I went into McDonalds to get a coffee, since everything at McDonalds is packaged to go. Apparently the opening of a McDonalds fronting the historic Plaza Zocodover was rather controversial, although it was allowed. I saw lots of people in the McDonalds, and it was not American tourists filling the place up. McDonalds in Toledo did not have American style drip coffee; it had the typical Spanish coffee selections of café con leche or café cortado. I ordered a café cortado and took it out to the plaza. I felt compelled to take a photo of it, which I’ll share here. This is a typical McDonalds coffee in Spain. I placed the guidebook I was using next to it for size comparison. A café con leche would have been a bit larger, due to the extra milk. It still would be much tinier than the coffee servings we’re used in the U.S.
After my snack, I was ready to go. I decided to walk back to the train station since it would be all downhill and pretty easy. As I left the plaza and started walking the direction indicated by the guide in the morning I got a bit worried that I couldn’t find the map he had given me. I must have dropped it somewhere, but I really wanted to verify my route before going far downhill. I stopped to check the other map I had purchased that morning, but I couldn’t orient myself with it after spending all day using the other style map. I stopped a young couple who were walking around with the same style map from the tour bus company and asked them in Spanish “Donde esta estacion del tren?” They didn’t seem to know, but responded to me with some English. I explained that I had lost my map and was turned around, but we were still not able to establish the correct route. They continued on their way as I stood there struggling with the strange map for another minute or two. Then they turned back to me and offered me their map and some new observations of how to follow it to the train station. That was so kind of them and typical of the people I encountered in Spain. I’m sure they just needed a few minutes to process through my question and comments, and once they had figured it out they offered as much help as they could give. Until I had the train station in sight, I was still a bit anxious during my walk through the walls of the old city and across the river on a scenic bridge. 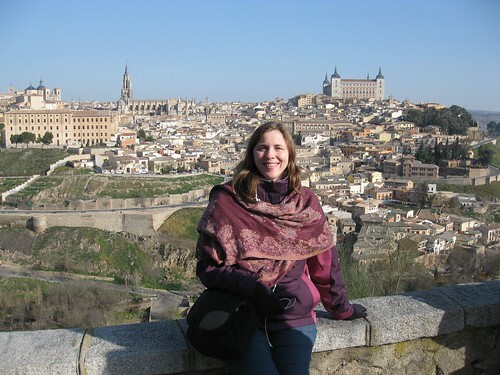 The topography of Toledo is so much a part of it’s charm. Because it is situated high on a bluff and surrounded on three sides by the river it’s easy to see why it was a desirable place to build a town back when land wars were common. At the train station I went to the window to buy a one-way ticket to Madrid. After I got my ticket I noticed the board announcing the departure schedule and saw how lucky I had been: with the exception of the train for which I was now ticketed, every remaining train was sold out that day! I don’t know what I would have done if I had decided to linger in the square even 20 minutes later; I may have been stuck in Toledo for the night! During the ride back to Madrid I fell asleep which made the already quick journey go by even faster. Although it was still pretty early by Spanish standards, I didn’t have much energy left after running all day on such a little amount of sleep so I decided it would be an early night. Besides, I had to pack and settle my bill that night since I needed to leave the hotel very early to catch my bus to Granada the next morning. While settling my bill at the hostal, I ran into a small snag. The hotelier had taken my reservation with a credit card, but I was now being asked to pay for the room in cash. Luckily due to my big withdrawal I had the 150€ on hand, but it necessitated another trip to the ATM since I definitely needed 120€ cash for my hostal in Granada the very next day. Throughout Spain I found that credit and debit cards weren’t used very much by locals. I had to pick up the habit since I usually pay for everything with one of my rewards credit card at home (I do pay the bills off every month). Next to the Starbucks was a little convenience store where I also bought a can of beer to enjoy with my sandwich that night. Beer helps me sleep well, and I was concerned that jet lag would mess me up again; the next day was going to start very early, so I needed to be well-rested! Before I had left on this trip, I considered taking a day trip to Segovia on this particular day. But I decided to skip the day trip and just stay in Madrid to explore. So, after getting ready (which included taking down the laundry I had washed the night before and hung to dry in the shower) I went out in search of some breakfast. This was the day I truly began to eat my way through Spain. I started out at a cafetería on Paseo del Prado where I ate a hardy breakfast: a small omeletta boccadillo (an omelet of eggs and potatoes on a roll) and a cup of café con leche. 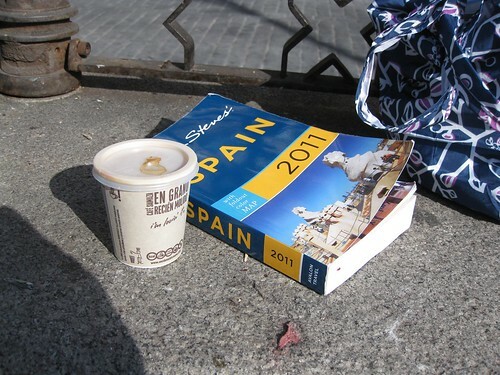 Actually, since I really needed the energy to get going, I had two cups of café con leche! I ate this sitting at the counter and avidly watching and listening to the action going on around me. I saw one man order a beer with this breakfast. It was watered down with something else (I couldn’t see what), but I clearly saw the beer being added to the glass from the tap. This was also the first time I saw someone eat the “olive oil and tomato on toast” that I had read about in the guidebook. It wasn’t what I expected. I had thought there would be toast, certainly, brushed with olive oil and then topped with sliced tomatoes. Instead what I saw consistently whenever anyone ordered this was a topping made of pureed tomato spread on the toast. It wasn’t tomato sauce exactly, but it was something similar. Tomato jam, perhaps? My breakfast came to 6€, so I paid the bill and left to wander the city streets. I scoped out the entrance to Museo del Prado. I wanted to figure out how and where to enter because I planned to return that evening during the free hours. Most of the museums in Madrid are free for the last two hours at least one day a week; visiting museums this way would save me money since I rarely have the mental energy to spend more than two hours at a time in a museum anyway. 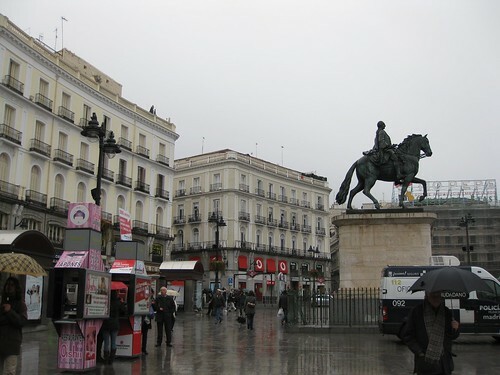 After my Prado planning was done, I headed to Plaza Mayor. The day was partly cloudy, but it was a Saturday and the city center was bustling with people. 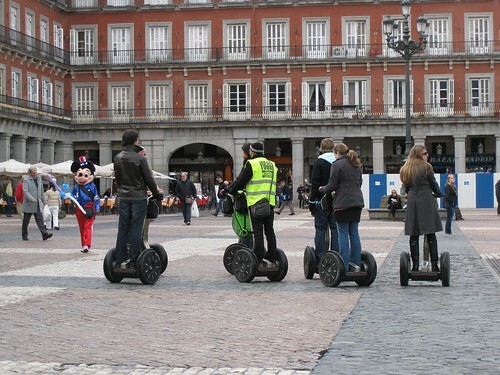 Busy Plaza Mayor, Madrid. All sorts of action to be seen! 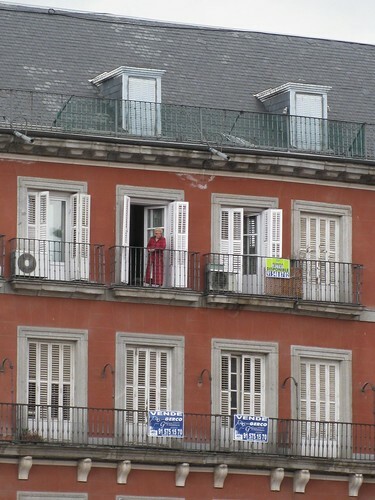 During the walk through the city I saw plenty of Se Vende (For Sale) signs hanging on the balconies of apartments. The housing crisis hit Spain hard, too, and I’ve heard several stories about Spain’s mortgage and banking issues on NPR and Planet Money podcasts. I was reminded of them as I walked along and viewed the real estate (and potential neighbors enjoying the morning air). I wandered further along Calle Mayor and ran across what became my favorite place in Madrid: Mercado San Miguel. 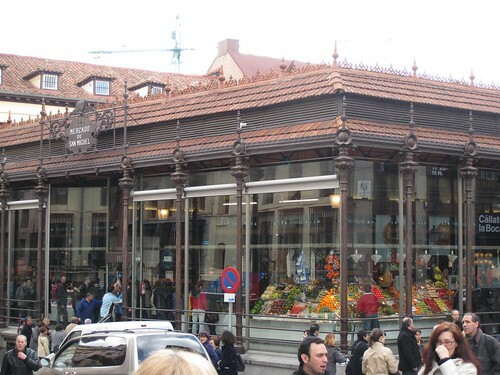 Mercado San Miguel. The best eating (and drinking) in Madrid! This market had only a cursory write up in my guidebook where it was described as a place to purchase gourmet picnic supplies. One could certainly stuff a picnic basket with the offerings, but the market also had tables where the food and beverages could be consumed on site. In addition to raw ingredients, there were many items ready for take away: canapes made with fresh fish or caviar; oysters; jamon; cheese plates; empanadas; olives; sherry; wine; beer; coffee; gelato; pastries and confections. I could go on and on about the bounty of the San Miguel Market! Since this was a Saturday the market was packed. As I drooled my way through the busy aisles I managed to find a small space at a bar where I purchased a noon-time snack. 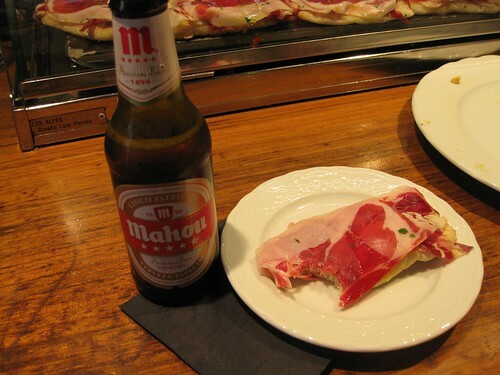 That’s a small beer (una caña) and a canape (open-faced sandwich) made with fresh bread and a few slices of the famous jamon, or Iberian ham. I didn’t want to spoil my appetite for lunch, though, so I left the market after my snack was finished and continued walking towards the Palacio Real. It was a beautiful day for walking and I savored my stroll, stopping to gawk at weddings and fountains and the beautiful facades of the buildings. I made it to the Palace and then…I decided I didn’t want to go in. It was 14:00 — the lunch hour in Spain — so I stopped at random restaurant for the menu del dia. Fixed price, three-course lunches that include a beverage (wine, beer, or coffee) are common in Spain and I enjoyed them whenever my schedule allowed. On this day I had ensalada mixta (mixed green salad), hake con arroz negra (grilled hake fish over rice cooked with squid ink), a vino tinto (red wine), and torta chocolate to finish. I splurged for a cup of cafe solo (plain espresso, no milk) to accompany my cake. My total lunch bill came to 11,90€. By now it was nearly 16:00 and I needed a rest, so I started the long walk back to my hostal. Along the way I stopped at an ATM to get more cash. The ATM I visited this time (a Deutschebank one) did not flash a fee screen at me, and since at this time I wasn’t sure how often I’d encounter fee-free ATMs, I tried to withdraw a fairly large sum: 400€. After a bit of churning, I got a message that my transaction was rejected by my bank, so I walked across the street to a Barclay’s ATM and gave that a try. I got the same message. I started to get worried that I’d have to go to the expensive ATM, and then my tired brain finalized reasoned it out: at home I have a $300 withdrawal limit and 400€ is much higher than that, so I should try again for a smaller amount. A withdrawal of 200€ worked with no fee message and I was relieved. While I had been able to use my credit card to pay for lunch, I knew I was going to need 120€ in cash to pay for my hotel room in Granada in a few days, and I wanted to get the money in hand. If I was going to have cashflow problems, I wanted to know as soon as possible. As I walked back to my hostal feeling much relieved, I stumbled upon one of those small neighborhood stores the locals called chinos and decided to look for a power strip. This store had a little bit of everything and I walked out with some fresh fruit and my power strip in hand. I took a short rest at my hostal before walking the two blocks to the Prado and strolling freely inside for the next two hours. With the exception of a few Goyas from his “black period” it seemed that the entire Prado collection was religious art. I’m glad I went, but I didn’t feel the need to schedule any more visits to Prado since I just don’t like that type of art very much. It was now about 22:00 on a Saturday night: prime dinner hour for Spain. I stopped at a place near my hostal that was bustling with people. There was no room at the bar (my first choice to dine since one can easily point to the sandwiches and canapes on display without having to figure out what to call them), but I was seated at a small table by myself. As I sipped my vino tinto and nibbled on the olives and canapes I had ordered (jamon de pato or “duck ham” and sardine with roquefort) I felt very lonely. I looked at the tables full of families and couples and felt conspicuous in my corner my myself. But I still savored the experience. I jotted in my notebook about my day and wrote about how fabulous the food was and how much I was enjoying it. I couldn’t finish the olives, but rather than let them go to waste, I offered them to a table full of fun looking people near me. They gladly took them with thanks (gracias!) and a smile. Then I paid my tab and went back to my room to call B and sleep. I’ve been home for six days and I think I’m firmly back on schedule now. The first two to three days were tough due to the jet-lag. I went back to work the day after I arrived home and worked a typically full day from 7 AM to 6 PM. I sneaked in a 30-minute nap during the afternoon and crashed fairly early that night. But by the third day I was re-adjusted to the time zone and getting by just fine. I took over 550 photos, but judicious pruning resulted in a final photo set of less than 450. I uploaded them all to my Flickr account with each photo titled and described (be sure to click on the Show Info link in the upper right when in slide show view to see the descriptions). I’ll be writing a travel log of the experience with key photos featured, blogging from the extensive notes I jotted down in a little notebook I carried with me every day. Also planned is a review of all those notes and my receipts to add up the amount of money I spent on this trip. At a minimum I can say I stayed within budget, and I suspect I actually spent less than budgeted. During the trip I checked my spending status a few times, so I could make corrections as needed. As I reflect on my trip to Spain, here are a few general things I noted about the experience. One of my best purchases while in Spain was a power strip. (In Spain, these are called a “ladron” which literally translates as thief.) I usually had a single power outlet near the bed in the small hotels and alternate accommodations I used, yet I wanted to plug in multiple electronic items each night. My iPhone (which I used for Skype each evening) and my tablet (a “rooted” NookColor ereader) were usually low on power at the end of the day, and with one outlet it would have been difficult to charge them both. I’ll be lending this power strip to a friend who is traveling to Europe next month, so it was well worth the 4,80 €. 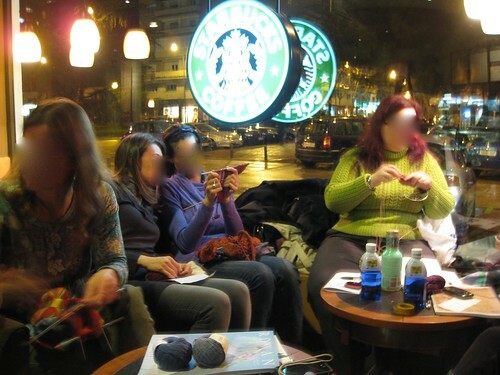 From a fashion/function perspective, nearly everyone wears a scarf in Spain. It was an exception to see someone not wearing a scarf. Men, children, and women of all ages were observed wearing scarves. I also saw many women wearing very tall boots (some above the knee) with leggings or slim pants, and shorts with tights. The latter look was not something I thought was very flattering for many. I was surprised by how much less I spent on food than was allowed for in my budget. I ate very well in Spain, but the cost of good food was much less than I thought it would be. I could have packed one less pair of pants and not packed my flip-flops at all. I was traveling as lightly as possible so any small bit of weight removed from my backpack would have been a good thing. Nonetheless, I probably would have saved only about one pound if I hadn’t packed these items. Those microfiber travel towels are awesome! I packed a decent sized one and used it mainly to squeeze extra water out of my clothes after washing since the places I stayed provided towels for bathing. I would hang the microfiber towel and my clothing, and they would be dry by the next morning. Amazing. I originally wrote this while in Sevilla, Spain. It got stuck in my Drafts, so it’s a bit dated. Rather than just dump it, though, I decided to push it through, even if it is a few days late. I’m home in Chicago now. More writing and photos about Spain will be posted over the next week or so. I took *a lot* of photos. I couldn’t resist the reference. It’s been raining off and on for days now, so many that I’ve lost count. I think today has been the worst, though, since the showers get fairly heavy at times. While walking to the Real Alcázar late this morning I became soaked to the knees and had to take shelter under an awning not far from my destination. To continue walking in the deluge would have been crazy. As I stood under the awning with others — one of the “gypsy” women, still clutching a sprig, and fellow tourists from points unknown — a man with a tripod in his hand and camera around his neck began commenting to me in rapid Castilian. I think the general meaning was that it rarely rains so heavily here. Finally the rain slackened to a more normal pace and I continued on. Alcázar was filled with tourists quite glad to linger in its many beautiful and dry rooms. By the time I reached the gardens the rain had stopped for a bit, but I still chose not to linger in them. I made a joke to myself that the gardens were full of gatos y patos (cats and ducks), and that the ducks had the advantage today. I have the rest of this day to sightsee in Sevilla, but the miserable weather makes the final item on my wish list — a stroll along the Guadalquivir River — a very bad prospect. So I will instead spend time reading, writing, and knitting in the apartment. With a bottle of wine at hand, of course, since it is vacation.